A scientific research lab has just produced a deadly formula which is stolen by a terrorist group. But before the terrorists can get too far they are all killed except one. He is wounded in the attempt and is accidentally infected. Although he manages to escape to a nearby hotel, he is eventually caught by the army and his body is burned in the mistaken belief that this will kill the virus within him. Unfortunately, the ashes infect a flock of birds who then attack a tour bus carrying seven or eight passengers. Meanwhile three soldiers in a jeep who were following the tour bus manage to evacuate the passengers, but one woman in particular has been bitten and needs medical help. So the soldiers take the passengers to an abandoned hotel and in the meantime an epidemic has begun which causes chaos and destruction all around. 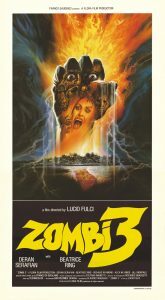 Now, although the title of the movie is “Zombie 3” there really isn’t a “Zombie 1”. Unless of course you consider the first film, “Zombie 2” as “Zombie 1” that is. If that makes sense. But in any case “Zombie 3” isn’t really a sequel anyway. Anyway, having clarified that let me add that this is a zombie film that relies heavily on smoke, action, gore and pyrotechnics first and foremost. Likewise, the music complements the action quite well too. However, the acting, character development and script are all secondary and as a result this movie suffers accordingly. So, if you’re looking for a good action-packed zombie film then this one might be what you’re looking for. Otherwise you’ll just have to make allowances.